Delta One customers will start with a warm welcome at our private reception area where our Elite Services team will take care of their every need. Let Delta handle check-in and luggage while our Delta One customers relax with a complimentary snack and beverage from the refreshment bar. Delta One customers will be escorted by our Elite Services team to a private access corridor leading to expedited security screening. If departing from Terminal 3 or Terminal B, simply take the inter-terminal bus to arrive at the gate in minutes. Once through security, Delta One customer will enjoy complimentary access to the Delta Sky Club® locations on the Mezzanine levels of Terminals 2 and 3, where they’ll find healthy food options, a fully stocked bar, complimentary Wi-Fi and more. Customers can download the Fly Delta app for interactive LAX maps to navigate through each terminal, search for restaurants or gates, see estimated walk times or get turn-by-turn walking directions and up-to-the-minute gate and terminal information. Please note: Advise Delta One customers to confirm their terminal before they arrive at LAX via delta.com/mytrips or the Fly Delta app. View complete details about our $1.9B Sky Way at LAX modernization to build the next generation of terminals. 1Customers traveling in Delta ONE on nonstop flights from LAX as well as on flights with connections (e.g. LAX-ATL-FRA where ATL-FRA is Delta ONE regardless of the cabin on LAX-ATL). 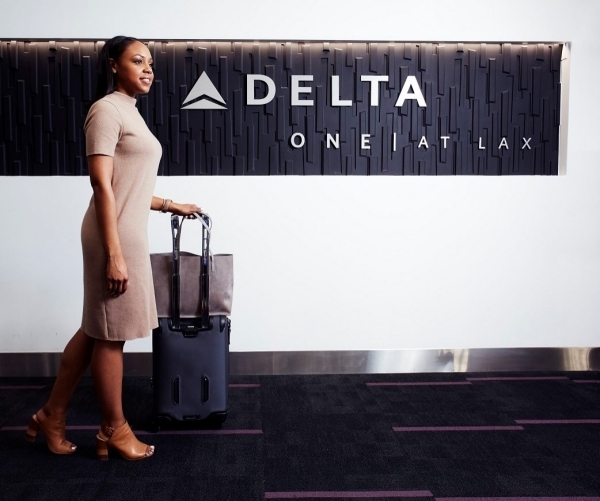 Customers in Delta ONE traveling on one of the LAX origin transcontinental markets – BOS/JFK/DCA, and on connecting itineraries similar to above. Customers who are part of Delta 360, an invitation-only program for our top Diamond Medallion Members ®, traveling in any cabin, any class and/or any market.